These innovative farmers sing in the fields and are also sought-after internationally touring folk music ambassadors. Their participatory performance is as fun and engaging and as fresh as an ear of green corn. The Maine Coast Worksongers have revived some of the oldest music from the fields, woods and ships of Maine and beyond, and they use them on their Downeast farms as tools of surprising efficiency and fun. Born on ships off the coast and in Shaker barns, in the north woods or in the grange hall, the songs and tunes they bring to their everyday work breathe life into repetitive tasks and lighten the load. And their music is in as much demand as their produce, which is legendary in its own right. 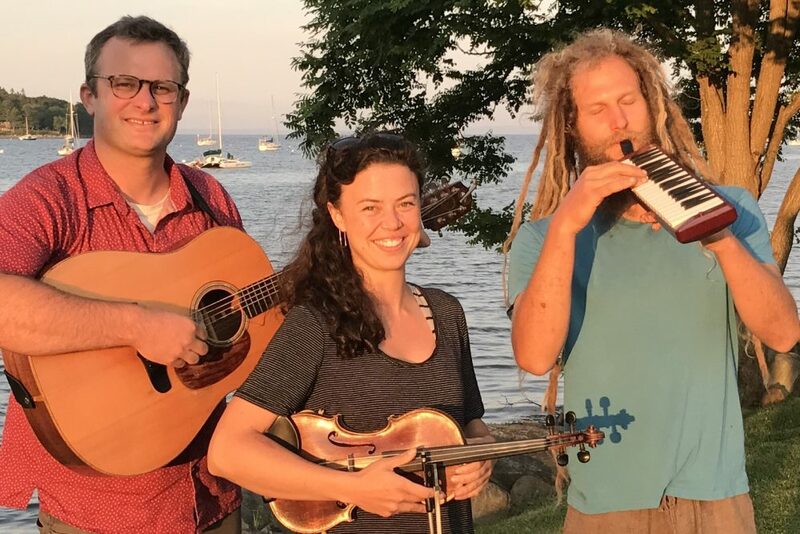 Edith Gawler and Bennett Konesni, the husband and wife team from Belfast, tour internationally and are known as standard bearers of traditional Maine music as taught to Edith growing up in Maine as a member of the legendary Gawler Family Band and at Maine Fiddle Camp. Bennett, who specializes in seed garlic at Duckback Farm in Belfast, took his experiences working on schooners in Penobscot Bay as a youth and turned it into a 20 year exploration of worksongs, assisted by a Thomas J Watson Fellowship to study musical labor in nine countries. Together, Edith&Bennett are Cultural Ambassadors for the US State Department, traveling to Ukraine and Mongolia to spread peace and international goodwill through traditional music. They are joined in this unique band by Shepsi Eaton of Darthia Farm in Gouldsboro, Maine. Shepsi’s high standards for quality and taste carry over to his music. He is a Princeton-trained pianist who traveled to India to study traditional yogic chants known as “Kirtan” and is recognized for his deep understanding of musical forms and playful intuitive approach to his instruments.